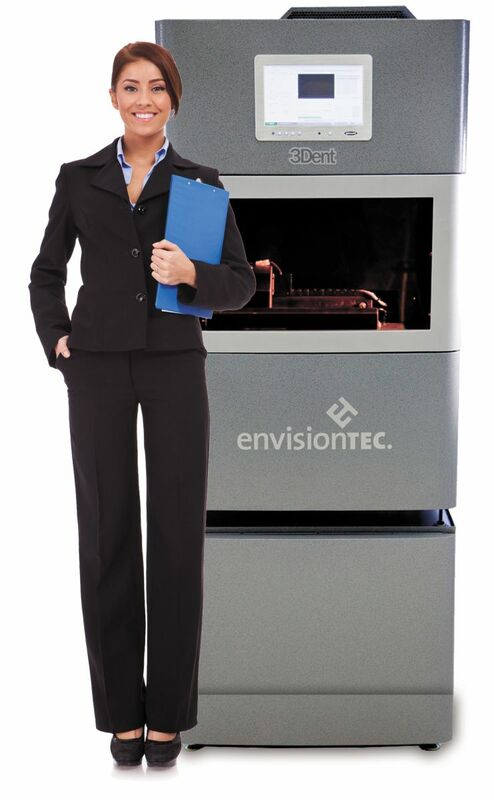 EnvisionTEC’s 3Dent™ dental model printer uses 3SP™ (Scan, Spin andSelectively Photocure) technology for the fast 3D printing of highly accurate dental models. The 3Dent™ features a build speed of up to 10mm/hour for the full build envelope, making it at least 2 times faster than any competitive product on the market today. A simple user interface with a built-in touch screen makes the 3Dent™ the perfect addition to any dental lab ready to transition into digital solutions. The low maintenance technology includes an imaging light source with a 2 year warranty. Currently the 3Dent™ is optimized for use with EnvisionTEC’s E-Denstone material for building high quality dental models. Utilizing a built in Ethernet interface, the 3Dent™ can easily connect directly to a PC workstation or be integrated into a network. The 3Dent™ has an embedded PC, allowing the system to work independently from the pre-processing workstation. The machine can be remotely monitored from any computer on the network using the communication software from the ULTRA® Software Suite. Any STL data format can be easily imported using the ULTRA® Software Suite.